My morning running plan was happily free of debate. No decisions to make about my route, gear or distance. I'd prepared to run 6 miles on the roads around my neighborhood and the cloudy and dry weather looked perfect. 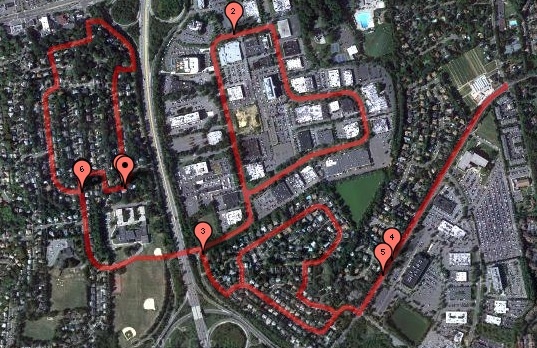 I started by running the loop I use every morning to benchmark my first mile. After that I diverted my course by running towards the middle school. Once I got there, I ran across the field to a path that took me to the nearby business park. I continued in that direction and ran the hilly loop before exiting into neighborhood #3 at the three mile point. I felt good as I moved along these neighborhood streets that led me out to Woodbury Road, a heavily trafficked street. Running along Woodbury Road's sidewalk is always interesting. In the fall there's often a thick covering of leaves that cushion each step. Today the sidewalk was bare and covered with packed dirt. Except for the cars whizzing by on the street, I felt like I was doing a mini trail run. I reached the easternmost point of my run and then switched directions back toward my house. I was on track to cover my intended six miles and ended up making it with a little distance to spare. I didn't run this route particularly fast but I was satisfied with the effort and pleased to have run a dozen miles over this weekend. The best part of finishing a couple of good weekend runs is knowing that Monday is my rest day. Another 20+ mile week is in the books. So far, so good for my half marathon training plan.